China Amulet against sickness, probably 19th century. Date : The style of this amulet is 18th to 19th century, but the casting quality suggests a date in the 19th century. Reference : Mitchiner (non-islamic) #4107. Grade : VF with two casting holes. Size : 46.7 mm. Weight : 27.87 grams. 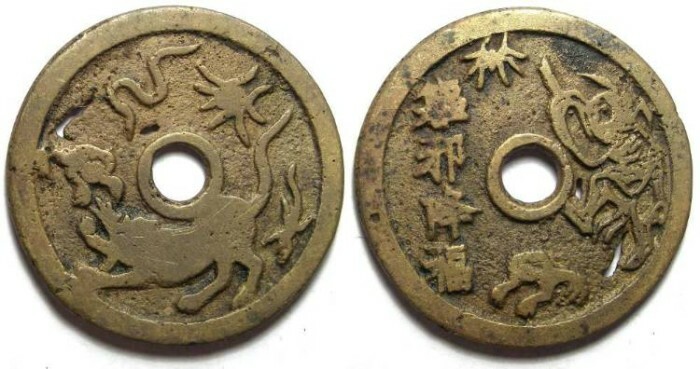 Obverse : The five dangrous animals (Tiger, snake, toad, spider and scorpion). Reverse : Old man possible representing Chan T'ien-hsi, playing a flut, with an inscription that translates as "WHO AVOIDS THESE DANGERS WILL BE HAPPY".